Katie and I have been pretty excited about our first post for the Holiday Recipe Exchange. After months of organizing while enjoying some of my No Bake Cookies in the process – we are ready to launch the series today with our first sponsor – Scharffen Berger. If you’ve heard of Scharffen Berger, you know their name and brand is pretty much synonymous with high quality dark chocolate. Scharffen Berger Chocolate Maker is the first bean to bar artisan chocolate maker established in the United States within the past 50 years. With a full line of eating and home baking products, Scharffen Berger® chocolate is made from the world’s best cacao beans that are perfectly fermented and roasted, elevating your classic recipes with new depths of flavor. 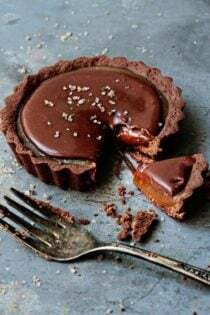 I came across this recipe for a Chocolate Caramel Tart months ago and knew immediately that this would be the recipe that I would be featuring for the Scharffen Berger Holiday Recipe Exchange. 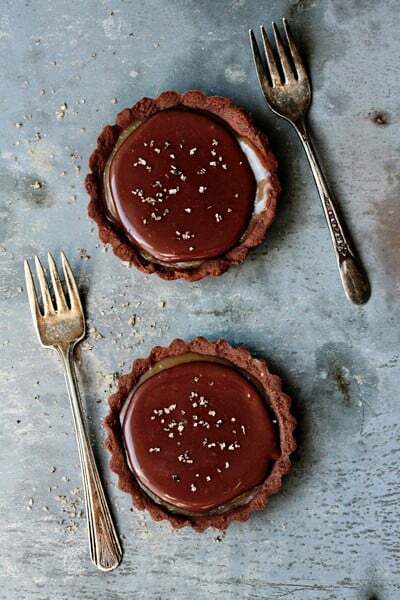 In my book, there is nothing more delicious and luxurious than a perfectly salted caramel dessert – add in Scharffen Berger chocolate and you pretty much have my version of dessert bliss. These tarts are not only decadent, rich and buttery, it’s knock-your-socks-off good! If I’m being honest, these mini tarts were my main source of nourishment for about a 24 hour period. Not that I’m encouraging this behavior – just warning ya! October 1st marked the the launch of Scharffen Berger Chocolate’s Elevate a Classic Dessert contest. Enter with an inspired dessert for your chance at prizes totaling $20,000! For more Scharffen Berger deliciousness, be sure to check out Katie’s recipe for Dark Chocolate Orange Pudding. 1. Prepare the Crust: In a medium bowl, combine flour, cocoa powder, and salt; set aside. Using a stand mixer fitted with the paddle attachment, or in a large bowl with a electric hand mixer, cream the butter and sugar until light and fluffy; mix in yolks and vanilla. Add in dry ingredients. Divide dough into 6 equal portions. Evenly press each portion into the bottoms and sides of 6 3.5-inch tartlet pan with removeable bottoms. Refrigerate tartlet shells for 30 minutes. Preheat oven to 350 degrees F, prick the tart shells all over with a fork. Bake in preheated oven until cooked through, about 13-15 minutes. Transfer to a rack and let cool. 2. Prepare the Caramel: In a medium saucepan over medium heat, whisk together sugar, corn syrup, salt, and 6 tbsp. water and bring to a boil. Cook, without stirring, until a candy thermometer inserted into the syrup reads 340°. Remove pan from heat and whisk in butter, cream, sour cream and vanilla (the mixture will bubble up) until smooth. Pour caramel into cooled tartlet shells and let cool slightly; refrigerate until firm, about 3-4 hours. 3. Prepare the Ganache: In a medium saucepan over medium heat, bring cream to a boil. Put chocolate into a medium bowl and pour in hot cream; let sit for 1 minute, then stir slowly with a rubber spatula until smooth. Spoon ganache evenly over tartlets and refrigerate until set, 3-4 hours. If desired, sprinkle tart with sea salt and slice. Serve cold. – To make a full size 9 inch tart: Transfer dough to a 9″ fluted tart pan with a removable bottom and press dough evenly into bottom and sides of pan. Refrigerate for 30 minutes. Prick the tart shell all over with a fork and bake until cooked through, about 20 minutes. Transfer to a rack and let cool. Fill with caramel chill for 4-5 hours and top with ganache and chill for 4-5 hours. Slice and serve cold. – If you not have vanilla Fleur de Sel, a simple sea salt will work perfectly. Submit your post before Oct. 10, 11:59 AM.